The first thing to say about the Mako Craft 450 Fisherman is that it is good value for money. The package, with a 40hp four-stroke and a respectable amount of fruit is $28,500. With the same power provided by a two-stroke the price drops to $25,900. In old money this runabout is around 15ft, which means it is the sort of boat to cope with four people on board, and has the credentials for the three-mile reef, Five Fathom Bank and the like. It is solidly built with 3mm sides and bottom and full seam welding where some others use stitch welding, but is light enough to be a good off the beach boat. It is easy to picture it parked alongside a beach shack. The 450 is not a dinghy tarted up into a runabout; it is the real thing. 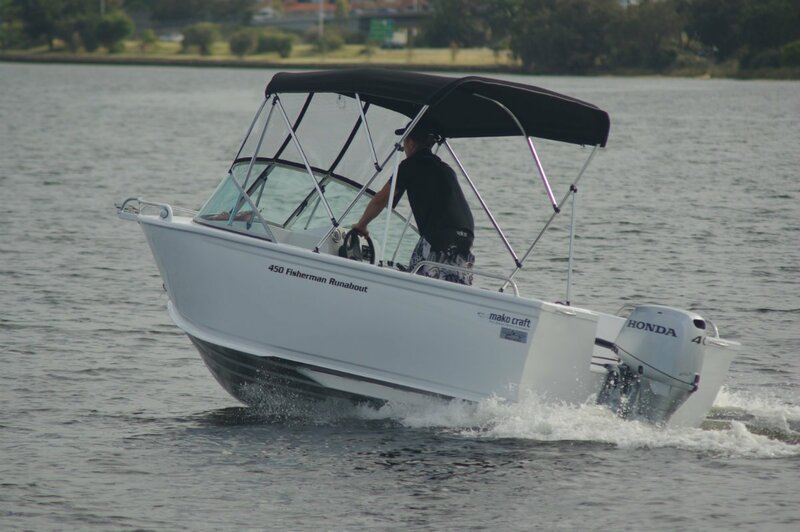 Good freeboard, full height motor well, foredeck of the right length to put the driver’s and offsider’s weight in the right place, and with good runabout features. 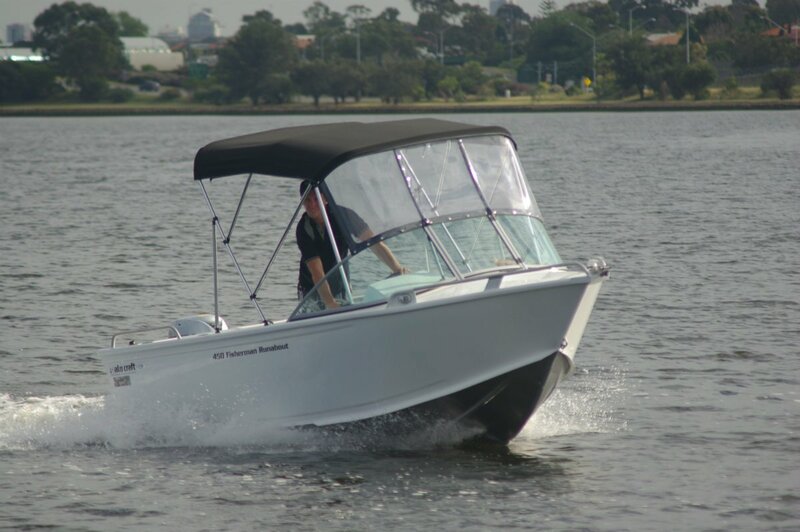 These include an opening windscreen and the aluminium anchor well that it gives access to. There are boats that hold down their price by using drop-in plastic wells. There are two classes of seating: a pair of good swivels at the dash and simple carpet covered aluminium infills either side of the motor well. Being that far aft they have less need of padding, but hedonists can order locally supplied padded backs and cushions. A standard contribution to comfort is a large Bimini equipped with clears. The deck is carpeted, but that is closer to necessity than luxury. Aside from unconfined storage under the foredeck there are not a lot of places to stow things, but those provided are well located: side pockets and, ahead of the first class passenger, a roomy oddments tray, which is probably more practical than the usual glove box. Other well placed items are the grab rails: aft, alongside the steerage passengers, and either side of the bow. Not that passengers are going to hang onto this pair – these well braced items come into their own for beach launch and recovery. The standard 450 does not have a built-in fuel tank. You can order one as an extra, but why bother? A pair of large portable tanks fit neatly under the quarter seats and hold about as much fuel as an under deck tank – and are a lot easier to clean out after a dose of contaminated fuel. Certainly they hold more than enough for a long day’s fishing. The 40hp Honda was good for 27 knots two-up, which is all most people would want, although If you regularly have three or more on board you might be happier with a 50 on the back. This is a pleasant boat to drive. The seats are comfortable, the boat responsive to wheel and throttle. There are spray rails on the chines forward and they do what they are supposed to do: suppress spray. There are some rails in existence that create it instead. This is a steady boat at rest, and part of the reason is a version of automatic water ballasting. The rear half of the bottom has a pair of self flooding skegs to add weight; they probably also help with the steady tracking and would likely be inhibitors of any tendency to broach in following seas. The Mako Craft 450 is one of those boats that could equally be the first, last or only one that an owner might buy. It has the great attraction in all three categories of a modest price, and in the second especially the charm of low labour requirements for trailering. A painless boat gets used more.